The second proof prints arrived last week, after getting held up by UPS (they didn't put a note through the door to tell me where they have left them - thankfully the kind people at the local UPS office let me get them after I proved my identity!). I have two people working through the book, and this will allow me to do any last minute fine-tuning, expand on anything they don't understand, and basically make it ready for publication. Without giving too much of the game away, this would be a good place to explain why I think this book will be useful to you as a someone looking to gain their CCNA. I spent a few years studying for my CCNA, due to changing jobs I started a CCNA course that took place one night a week at my local college, dropped it due to a new job (which meant I would be returning after the class had started and would miss most of it), and then picked it up again, reverting to self study. Once I got my CCNA, several years after starting the studies, I started to hear the words "You have your CCNA, you should know how to do this", or "You got your CCNA, this should be easy". Well, the answer, in both those cases, was "no, actually, this is probably CCNP level at minimum", and this is all partly due to the other party not understanding the topics covered by the exams, or what it actually entails. 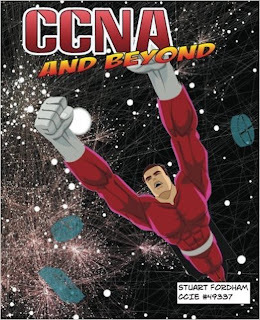 The first job I had post-CCNA was actually very well suited to what the CCNA taught me. Most of the clients had just a couple of devices, and life was simple. I could configure a switch and a router, easy. I then moved to an enterprise-level company and my whole viewpoint changed. There were multiple routers, multiple switches, and the CCNA had not properly prepared me for this. It did not talk about cause and effect when working with large-scale networks, and it was all very daunting. So I studied for my CCNP, and life got easier, and I studied for my CCIE and life became easier still. Things made more sense as my knowledge widened, and there element of "oh-boy, this is complex" reduces. During my CCIE studies I started to make notes, pages and pages of notes. I started with BGP, and thought that I would give publishing on Kindle a try. So I did. I published BGP for Cisco Networks, and it was received pretty favourably. I did make to make a second edit of it though, but we live and learn. A colleague then suggested I try Createspace, and publish in paperback, which I did, and this does better than Kindle, so it's nice to know that print is not dead. I then published MPLS for Cisco Networks, and after that VPNs and NAT for Cisco Networks, and again, these do pretty OK, given the fairly small market that they are aimed at. I included my email address in the books, and get a couple of emails a week, then overwhelming response is that people like the fact that my books are a little bit different. Instead of examples with a couple of devices, you actually have to build a network from start to finish. So when (and I hope you will) buy my book, don't be alarmed at the large network you will have to build, there are fifteen routers, four switches, as well as three routers acting as clients and a server. There is a troubleshooting section, which also has fifteen devices, and you need to fix it to get from one end of the network to the other. Then there is a chapter which brings in some of the CCNP topics, but which you should know earlier on, and will show how a network truly operates. This is more like real-life though, and, I certainly feel, a better way of learning how to build networks from the ground up. The book should be published either at the end of this month, or early February.